I am delighted to announce that Wipf and Stock, publishers in Eugene, Oregon, has recently published in their selective Cascade Series a new book of mine entitled Parabolic Figures or Narrative Fictions? 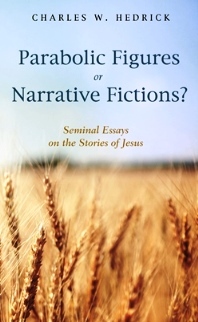 Seminal Essays on the Stories of Jesus (Eugene OR: Cascade, 2016); the cost is $38.00 from the press. It is available at Amazon, Barnes and Noble, etc. and even in electronic form. In the book I contend that parables do not teach moral and religious lessons; they are not, in whole or part, theological figures for the church. Rather parables are realistic narrative fictions told to Judean peasants, and like all effective fiction literature the stories are designed to draw auditors (and now readers) into their story worlds where auditors and readers make discoveries about themselves by finding their ideas challenged and subverted—or affirmed, by the stories. The parables have endings but not final resolutions, because the endings raise new complications for careful readers, which require further resolution. The narrative contexts and interpretations supplied by the evangelists constitute an attempt by the early church to bring the secular narratives of Jesus under the control of the church's later religious perspectives. Each narrative represents a fragment of Jesus' secular vision of reality. I have been invited by Barnes and Noble in Springfield, Missouri for a meet-the-public and book signing on October 22, 2016. If you are in town, drop by and let's chat a bit about parables, my blog, or you could just share a bit of your own thinking with me. I am always happy to entertain new ideas. What do you think of the parables as stories for a Judean peasant audience? *adapted from the back cover of the book; used by permission of Wipf and Stock. As I understand it: the null hypothesis is the point where discussion bogged down in responses to my last blog (June 25, 2016): Gene suggested that we might be mired in a null hypothesis—that is to say, it is just as plausible to believe in spirits as not to believe in them. He asked Jim to suggest a scientific study showing that not believing in spirits is a more reasonable position than accepting that there were such entities as spirits. In this brief essay I will try to move us forward by attempting to show that it is more plausible to attribute the effects of illness, disease, and mental abnormalities to natural causes than to possession by unseen spirits. In the common tradition shared by Matthew, Mark, and Luke the three evangelists report the same story, each in his own way. The current generally-accepted theory of their relationship is that Mark wrote first, and then Mark's narrative was used as a source independently by Mathew and Luke. Mark (9:14-29) recounts that a boy, possessed by a mute spirit (9:17, i.e., a spirit causing muteness), was brought to the disciples who could not "cast it out" (9:18). The description of the spirit's effect on the boy is frightening (9:20-22). Jesus casts the spirit out, adding that it was also a spirit causing deafness (9:25-26). Luke's narrative (9:37-43a) is shorter and attributes the boy's ailment simply to "a spirit" (9:38), which later turns out to be "an unclean spirit" (9:42), which Jesus "rebukes and heals the boy" (9:42). Matthew's narrative (17:14-21) is also shorter than Mark and adds that the boy is an epileptic (17:15) and, more to the point, describes his epilepsy as caused by a demon (17:18), which Jesus rebukes and cures the boy. The word translated epilepsy is literally translated "moon struck," for "in the ancient world epileptic seizure was associated with the transcendent powers of the moon. "* Matthew gives the disease its "proper" medical term for antiquity, but regards epilepsy as a disease caused by demon possession. Hence, I offer this single statistic, a single variable: that is, epilepsy responds to medical treatment. This datum shows, conclusively in my judgment, that believing epilepsy is caused by evil spirits is a flawed perception of reality and may very well be dangerous to the welfare of those afflicted with epilepsy if their immediate caregivers persist in believing that epilepsy is caused by evil spirits. While it is only a single variable, I suggest that the number of variables will greatly multiply if one makes a study of other illness and diseases, previously thought to be caused by evil spirits, which with the advent of modernity have been shown to be the result of natural causes. Nevertheless, not all who live in the 21st century are really completely a part of the 21st century, and persist in the belief of evil spirits. A case in point is Dr. Richard Gallagher, a board-certified psychiatrist, who is described as a professor of clinical psychiatry at New York Medical College. Mr. Gallagher seems clearly to believe in demon possession. http://wapo.st/293X0vb?tid=ss_mails Has Mr. Gallagher matched my single variable with multiple variables of his own? If so, we are still mired in the null hypothesis—that is to say, because of Mr. Gallagher's testimony about exorcising evil spirits, it is as reasonable to seek help from exorcists for illness, disease, and mental abnormalities, as it is to seek help from medical professionals. Where do you come down on this statement: exorcism and medical treatment are two equally valid ways of treating epilepsy? *F. W. Danker and Walter Bauer, A Greek-English Lexicon of the New Testament and other Early Christian Literature (3rd ed. ; Chicago and London: University of Chicago, 2000), 919.